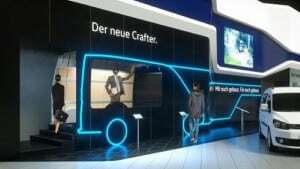 Volkswagen has been stepping up its game for this month's BAUMA World Trade Fair Show in Munich, where the automotive manufacturer is showcasing its new Crafter model in virtual reality. Highlighting the company's entire commercial vehicle range, the all-new Crafter will be the centrepiece of the firm's exhibition offering, with all those in attendance being the first in the world to catch a glimpse of this latest iteration of the popular van design. Now taking place at Messe Munchen and running until April 17th, this world-class event sees Volkswagen Commercial Vehicles highlighting the firm's multitude of options that are open to fleet operators keen to enhance their vehicle offering with the latest new models. Alongside its innovative virtual reality Crafter showcase, the stand also includes the Caddy Alltrack and Transporter panel van, with the marque aiming to build a real buzz around each of these models and their latest updates for 2016. BAUMA is the world's largest trade fair and brings together more than 3,400 exhibitors from across the entire spectrum of industry, with everything from the latest industrial mining equipment to that sporty new executive runabout on display, all for guests to enjoy. Open daily from 09:30 to 18:30 CET, the event is a chance for Volkswagen to stand out from its competitors and showcase its designs to the eager crowds.